If you’re considering Harvard University, or you just want to see what student life is like at this Ivy League establishment, this 70-minute ‘Hahvahd’ tour is for you! Enjoy a one-of-a-kind dramatic presentation given by current Harvard students who share their insider perspective of college life in Cambridge. You’ll see historical buildings as you tour Harvard Yard and Harvard Square, hear stories about the school’s history and learn about some famous people who attended the school. As you tour the grounds, be entertained by your guide’s stories and Harvard lore – partly scripted and partly shared from personal experience. Learn about the most famous people to attend Harvard, hear historical anecdotes and get an insider’s view of current college life. 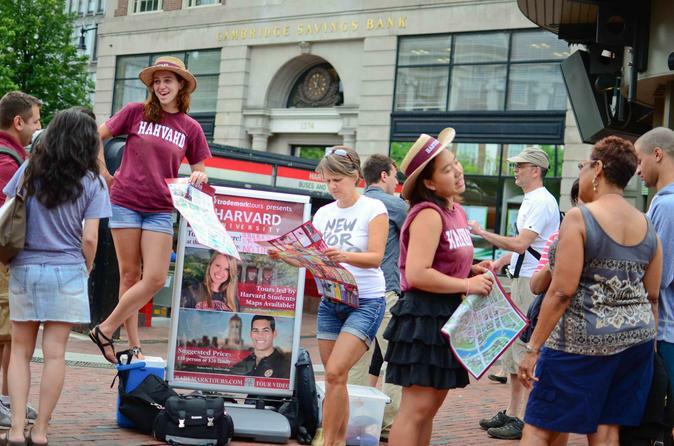 After a stop at the Plaza, Winthrop Park and Mt Auburn Street in Harvard Square, complete your tour at the Harvard Shop, a student-run souvenir shop.